Saiko gets that "I didn't expect that!" feeling. I haven’t written much about season 2 of Bakuman, but I am pleased to see that after a first season that was disappointing, and a second season (or at least 21 episodes of it) that were occasionally entertaining, but also dragged quite a bit, Ashirogi Muto seem to have finally got it back in gear. I enjoyed the enthusiasm on display in the first few episodes of the first season, and was willing to write off the entire first season as merely the story of how the real story started, and there were some good parts of this second season, but most of this second season has been Ashirogi Muto struggling to put a successful idea down on paper. That might be realistic drama from the manga industry, but that mixed with sub-standard romantic faire wasn’t satisfying for me. Finally (FINALLY!) in episode 22 of the second season, the boys seem to have hit upon a successful idea for a manga. This is the first idea they have had that actually sounds interesting to me. Hopefully this season will wrap up in a nice fashion, and I can feel good about dropping it. 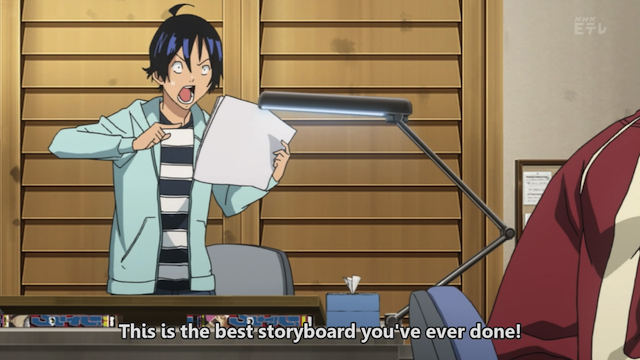 Bakuman season 3 has already been announced for Fall 2012, but I think I have given all I can on this series.